Auckland is the most populous city in otherwise sparsely populated New Zealand and is located in the northern part of the North Island. With around 1.4 million inhabitants and an area of over 5000 km², it is considerably larger than the state capital Wellington. The Auckland region is also home to the country's most important airport, AKL International Airport. In addition to a beautiful, active city centre, Auckland has a lot of nature to offer. There are 50 inactive volcanoes in the city. Extensive parks on the volcanic hills shape the cityscape. "City of Sails" is the metropolis between Tasman Sea and the Pacific Ocean, because nowhere else are there more boats per inhabitant. Many New Zealand travellers choose to rent a car from a car rental company to explore the diverse landscapes. Beautiful coastal roads, extensive hilly landscapes, subtropical rainforest and volcanic regions alternate. You can rent a car from the car rental company of your choice before you start your journey. Alternatively, you can rent a car cheaply at one of the airports in the country when you arrive. You can start your exploration tour immediately from the airport car rental pick-up point. Most international guests arrive at AKL International Airport, Auckland Airport is located just outside the city gates in the Manukau district on the southern edge of the Mangere district. It is an important hub for airlines in the Pacific region. Like most airports in New Zealand, Auckland's airport is not very large by international standards. There are two terminals at Auckland Airport, one for national flights and the other for international flights. In ten minutes you can walk from one terminal to another or take the free shuttle bus, which runs from 6 am. to the night hours on the airport grounds of the AKL. When entering the country, the import restrictions must be observed. There are strict regulations as to what tourists are allowed to bring with them when they arrive at the airport. After passport control, baggage pick-up and customs clearance, you can rent a rental car at Auckland Airport for your further journey at a reasonable price. It is advisable to consider where to go before renting the vehicle. For shorter distances from Auckland International Airport, a smaller car, which can be rented for less, is sufficient. For longer journeys or tours over impassable terrain, the rental car should be comfortable and technically well equipped. Campers can rent a camper van to explore the area. If you are not sure what the road conditions are like in a certain area, ask for information at the airport or at the car rental office. With the car of your choice, you can start immediately from the rental car pick-up station at the airport. At AKL International Airport, rental vehicles can be picked up directly from a car rental company in the terminal or from a provider outside the airport. A number of well-known car rental companies have information desks on the ground floor of both terminals at the airport. Here, travellers can find out where they can pick up a car booked online or rent a vehicle directly on site. Not every car rental company at Auckland Airport has an information desk at the terminals. Some branches are located outside the airport grounds. So that you can still rent a rental car and pick it up quickly and easily, there is a free shuttle service that will take you from the airport to the car rental office in just a few minutes. If you want to contact a car rental company outside the terminals, you can usually call a toll-free service number at the airport. If you want to take a stroll through Auckland, 30 km away, you will leave AKL International Airport on the 20A in a northerly direction. For excursions to the interior of the North Island, head east on Tom Pearce Drive and the Puhinui Road, which leads to 20B and finally to Highway 1, an important north-south link. Places of interest such as Rotorua or Lake Taupo are about 200 km and 280 km away from Auckland Airport. For a visit to Cape Reinga, the northern tip of New Zealand, you will have to drive about 430 km from AKL International Airport. Before starting a long tour with the rental car, the tank must be well filled, because it is difficult to find a gas station in the remote areas. Where can I refuel my Rental Car at Auckland Airport? For example, petrol stations at the airport are located on Tom Pearce Drive a few kilometres from the pick-up station at Auckland Airport (AKL). Is there a toll charge in New Zealand? There is no general toll charge in New Zealand. However, some routes are subject to toll charges. For this reason, travelers should check with their car at the pick-up point at the car rental company before departure to find out how the toll is charged. If you would like to travel to the South Island by car from North Island with Auckland Airport, please ask the car hire company if you are allowed to take your car on the ferry. Some car rental companies require that the vehicle stay on the North Island and travel to the South Island must be continued in another car from the same car rental company. Alternatively, you can also book a cheap domestic flight to one of the airports on the South Island. In addition, it is important to note that some roads may not be rented, such as Skippers Canyon Road, Ball Hut Road or Ninety Mile Beach on the northern tip of the North Island. You will find detailed information about this in the contract documents of your car rental company. Compared to European conurbations, road traffic is relaxed. Only in the conurbations do you have to expect high traffic density. As soon as you leave the city areas or airports by car, there is relatively little traffic. 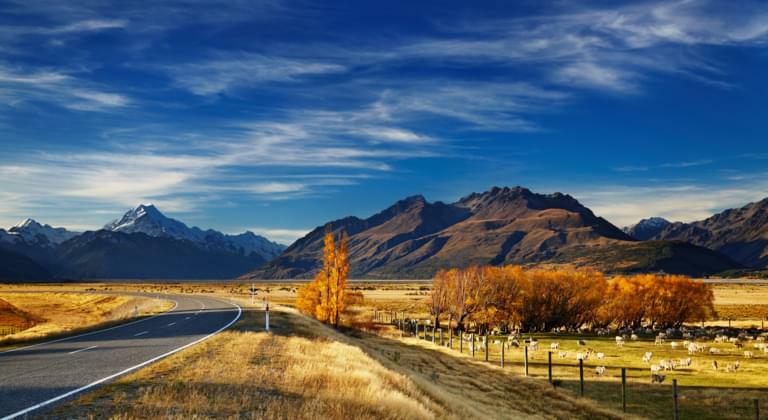 New Zealand is a country with left-hand traffic. When renting a rental car, travellers from countries with right-hand traffic must get used to the left-hand drive car. Gear shift and turn signals are operated with the other hand. When leaving the pick-up station at the airport, make sure that you do not mistakenly place yourself in traffic. Especially in a roundabout the unfamiliar left-hand traffic can be confusing. A tour with a rental car is a wonderful thing, but can sometimes be a challenge. For travel planning, you have to convert the miles into km. The quality of the roads is very different. From the well-developed motorway and country roads to the gravel road, you can meet everything when travelling with a rental car. Particular care must be taken on single-lane roads and level crossings without traffic signals. Animals on the streets are not unusual in rural areas. For more information on the special features of New Zealand's road traffic, please visit the car hire pickup point. New Zealand is ideal for exploring by car. With a national and international car rental company you can rent a car in different sizes and designs at New Zealand airport. After passing through the passport and customs checkpoint, you can rent a rental car at AKL International Airport to be mobile and independent. Auckland and its environs offer many fascinating sights that can be easily reached by car rental. The mixture of city and port makes the city tour through Auckland an entertaining experience. Rent a car at the airport and get to know the hospitable atmosphere of the metropolis. In the city centre, High Street with its shops, cafés and restaurants invites you for a leisurely stroll. Here you can experience the typical relaxed atmosphere of Auckland. Near the Garnet Road, a completely different way of walking opens up: here, mudflat walks with a view of the Auckland skyline are possible. A visit to the two large natural bays is ideal for enjoying the maritime character of the metropolis. The Sky Tower dominates the skyline of Auckland. If you appreciate a fantastic view of the city, the surroundings and the ocean, you can visit the tower's viewing platforms. A special attraction is the Skyjump, a basejump with a computer-controlled wire rope from the tower. A picnic in one of the numerous parks is a great way to relax. Auckland. In the city area there are 50 inactive volcanoes covered by extensive green spaces. The natural hilly landscape offers numerous beautiful viewpoints for a good view over the city. The largest city park is Auckland Domain, a popular meeting place for residents and tourists. In Auckland, the opportunity to get to know New Zealand's unique wildlife at close quarters is a good one. The Auckland Zoo offers a unique opportunity to observe the country's national animal: the kiwi. Another tip for animal lovers is Kelly Tarlton's Underwaterworld. The aquarium is located east of the city centre and can be reached by car in ten to fifteen minutes. Here, visitors stroll through a large tunnel of transparent windows and marvel at the underwater world that surrounds them. Daredevils seek direct contact - for example in the penguin enclosure or while diving in the shark tank. Kia Ora! You will hear this greeting everywhere in New Zealand. It comes from the Maori language. If you want to learn more about the fascinating culture of the indigenous people, rent a car at Auckland Airport and drive to the Auckland Museum. Here you will find an extensive exhibition about the Maori with lots of information. If you want to learn more about the culture of New Zealand's indigenous people, you can rent a car and drive to Kerikeri, where Rewa's Village, a reconstructed Maori village, is located. The centre of Maori culture can be found in Rotorua, 200 km away, where you can visit Tamaki Maori Village and the unique woodcarving school for Maori artists. There is something very special to be discovered about southeast of Auckland. Here the Hobbit village is built up from Peter Jackson's "The Hobbit" and is accessible for visitors. The opportunity to rent a car at Auckland Airport to visit the lavish film sets is not only for fantasy fans. In Hobbiton you can take part in a guided tour to get information about the filming and visit the original locations of the Lord of the Rings filming.